DERRY CITY MOVED back into second place in the SSE Airtricity Premier Division with a narrow 1-0 win over St. Patrick’s Athletic at Richmond Park tonight. The winner came courtesy of a well-worked goal from Barry McNamee which ensured Derry bounced back from their surprise loss at home to Sligo last week. Liam Buckley’s Pat’s side tasted defeat for a third time on home turf this term as they looked devoid of creativity in the final third. Pats made four changes from last week’s loss in Cork as goalkeeper Brendan Clarke, captain, Ger O’Brien and Graham Kelly returned to the side while Jamie McGrath made his first league start as top scorer Christy Fagan missed out again. But despite the changes, the performance failed to move up a gear as Derry looked the most likely to find a goal in the first period with Conor McCormack looking lively in midfield. 10 minutes in, McCormack turned Conan Byrne before he raced clear of his opposite number and found Ronan Curtis, who went on a mazy run before laying off to Keith Ward. His shot was blocked by Darren Dennehy, with Brendan Clarke scrambling back towards his goal to see it loop just over. Pat’s looked aimless in their passing and didn’t have their first effort on target until the 43rd minute as Ian Bermingham made ground up the left before finding David Cawley on the edge of the area but his long-range effort was comfortably saved by Gerard Doherty low to his right. Pat’s did look reenergised after the interval as Cawley was more composed in the middle of the park. The home fans were left incensed 13 minutes into the second half as Keith Ward stumbled into Bermingham just inside the box but referee Tomas Connolly waved away the penalty claims from the Saint’s left back. Moments later Derry compounded the anger from the Inchicore crowd as they took the lead. McNamee played a neat one-two with Rory Patterson just inside the box, with the flat-footed Sean Hoare taken out of the game. That left McNamee with the opportunity to calmly slot just inside the post from 8 yards. Derry should’ve sealed the win 15 minutes from time as Hoare again misjudged a bounce on the edge of the box which was pounced upon by Patterson. He sprinted through on goal before Doherty saved with his body – the ball narrowly sailing over the bar. Pat’s threw caution to the wind as they attempted to salvage a point and introduced Dinny Corcoran with 12 minutes left. Their best opportunity of an equaliser came soon after when a searching long pass from Dennehy wasn’t dealt with by Aaron Barry, allowing substitute Dylan McGlade a chance. But, after picking the ball up in the inside right channel, he fluffed his lines as he bore down on goal – his shot tamely bouncing across goal and wide. Derry comfortably saw out the remaining minutes to ensure a fifth league defeat of the season for the Dublin side. ST PATRICK’S ATHLETIC: Brendan Clarke; Ger O’Brien (c) Ian Bermingham, Darren Dennehy, Sean Hoare; David Cawley (Shane McEleney, 85), Conan Byrne (Dylan McGlade, 66), Mark Timlin, Graham Kelly, Billy Dennehy (Dinny Corcoran,78); Jamie McGrath. DERRY CITY: Gerard Doherty; Niclas Vemmelund, Ryan McBride, Aaron Barry, Patrick McClean; Aaron McEneff, Conor McCormack , Keith Ward, Barry McNamee; Ronan Curtis (Nathan Boyle, 89) , Rory Patterson. Email “Red sky and red faces as Pat's succumb to 5th league defeat of the season against Derry”. 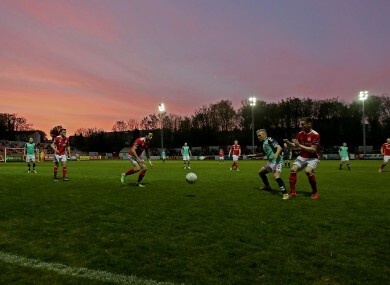 Feedback on “Red sky and red faces as Pat's succumb to 5th league defeat of the season against Derry”.